Our facial treatments offer personalized treatments that use a variety of results-oriented products, carefully selected for your individual needs. Our therapists also provide recommendations for a corrective skin-care regime that its your lifestyle. For long-term results and optimal skin care, we recommend a monthly facial. This treatment is designed to get your skin in shape and glowing. It is great for eliminating clogged pores, blackheads and dead skin cells to reveal a more radiant skin and promote the skin self rejuvenating power. Treatment includes cleansing, exfoliating, steaming, moisturizing and the use of a mask best suited for skin type and finished off with a facial massage. A chemical peel using glycolic + lactic acid, help to clear acne scars and hyper pigmentation for that instant glow. Book this treatment for a more hydrated and healthy skin. Our treatment using the power to nature to revive and replenish your skin, finished with a full facial dermal pin treatment to stimulate collagen production and promote skin elasticity. So you just had a facial, you feel the stress lines on your face have disappeared, you are relaxed, your face feels smoother, your experience was amazing, smile is radiant and your skin is glowing. You are now wondering how to keep the glow at home. For you we have created our own blend using 6 plant extracts to calm, sooth and repair your skin at cellular level. Each ingredient plays a crucial role as part of the blend, and so each bottle contains only vital nutrients to nourish your skin, rebalance troubled completions, and stop signs of aging. Kemi personally makes the blends herself, production is in small batches to guarantee the freshest, most efficacious formulas, using amber bottle to maintain the integrity of the oils over time. 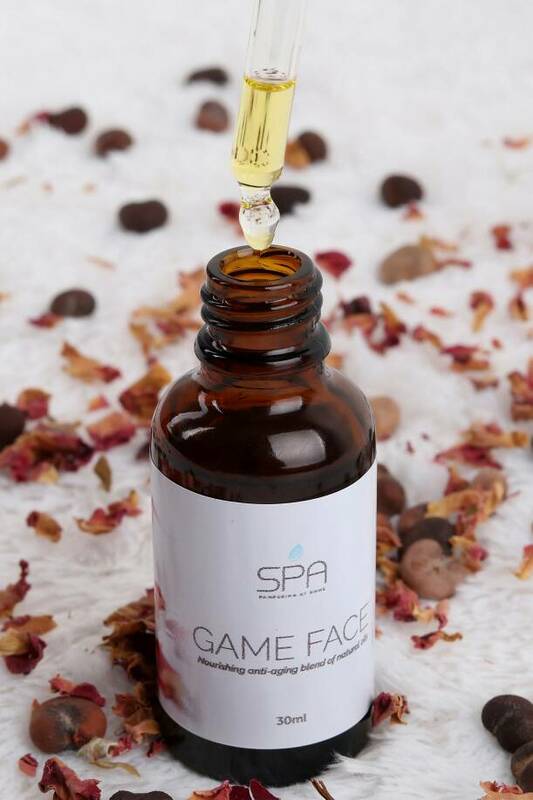 A natural anti-aging facial oil, contains Jojoba, Baobab, Rice Bran, Rose Otto, Elemi & Myrrh Game face is suitable for all skin types. Use day or night to balance sebum production for acne prone skin, contains regenerative baobab and myrrh oil, to hydrate your skin and diminish the appearance of fine lines. Get the glow.